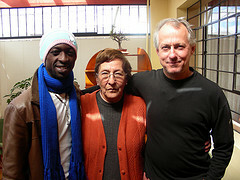 Today was an early rise to pick up Njurah at the Cusco airport. 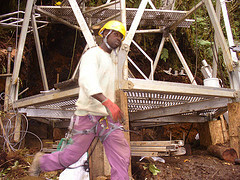 Njurah is a young man from Nigeria that Greenheart Conservation flew over to Peru to work on its canopy walkway project. A few years back Njurah helped construct GreenheartÂ´s canopy in Afi Mountain, Cross River state. The Greenheart crew took a real liking to Njurah and decided to bring him to Peru for a â€œSouth-South technology transfer.â€ His experience building a canopy walkway would be invaluable to the Peruvian project and the cultural interchange would surely be unforgettable for all involved. I was nervous as we drove to the airport, picturing him stranded in Sao Paulo or Lima, or maybe he didnÂ´t even make it off the continent of Africa. He had never travelled on a plane and all his random 4:00am phone calls to me over the past weeks, as we arranged his flights and visas, added to my anxiety level. But he arrived right on time, passing through the airport gates grinning and sounding out a distinctive whistle to John! On top of bribing Nigerian immigration officials and arriving in the midst of another strike in Cusco, he made it through 4 flights and 3 different countries. Yes, I do believe in miracles. We headed to the offices of ACCA (AsociaciÃ³n para la ConservaciÃ³n de la Cuenca AmazÃ³nica) to introduce him to the office staff. Days later the staff would still be talking about the young man from Nigeria, wondering what he thought of their city, and if he would fall for a CuzqueÃ±a. In the coming week word would come back from the canopy walkway site that the first tower was nearly complete and Njurah was wowing the Peruvian crew with his tree climbing skills. The strike ended and Njurah was finally able to hit the road and head up to cloud forest canopy walkway project. Time for me to switch gears and dive into literature and case studies on so-called pro-poor REDD schemes. REDD is essentially an international avoided deforestation mechanism aimed at reducing greenhouse gas emissions from deforestation and degradation in the forests of developing countries. Participatory processes are seen as key to developing a REDD project that is pro-poor and delivers benefits at the local level. A pro-poor REDD scheme has the potential to reduce poverty in forest communities, not just through procuring an income stream from the sale of carbon credits, but if done correctly, it could also reduce elite-capture and provide communities with funds for development (i.e. better access to education and/or sanitation projects). Beyond the moral argument for a participatory approach to REDD, evidence shows that local-level stewardship of natural resources is an effective means of achieving conservation objectives. The next step is taking these relatively new concepts and putting them into practice with the folks here at ACCA. Talk about experiential learning at its best! Luckily for me, just this week, a new volunteer arrived. She is a Yale trained lawyer (lots of Yale folks tend to grace this office â€“ all part of the EDÂ´s network) who is providing ACCA with legal advice as they move forward on developing REDD schemes in Peru. Our lunch hours are spent digesting all we are learning on REDD, whether it be concepts from literature or the last meeting with had with ACCA folks to discuss developing a project that is more marketable through a portfolio approach, in other words, stacking other ecosystem services (e.g. biodiversity, water quality and culture preservation) on top of carbon credits.